For email marketers, mid-week may provide the best engagement rates, but the weekends are when conversions are highest. That’s according to Yesmail, which included a day-of-the-week analysis in it latest quarterly benchmarks report. Looking specifically at this past quarter (Q2), the report indicates that email volume was highest on Thursday, when 20% of emails were sent. That was twice as many emails as were sent on Sunday (10%), with Saturday also lagging in email volume (11%). Interestingly, though, that high volume did not have a negative effect on email engagement. By contrast, open rates were highest on Thursdays (16%), as were unique click rates (2%) and click-to-open rates (12.2%). 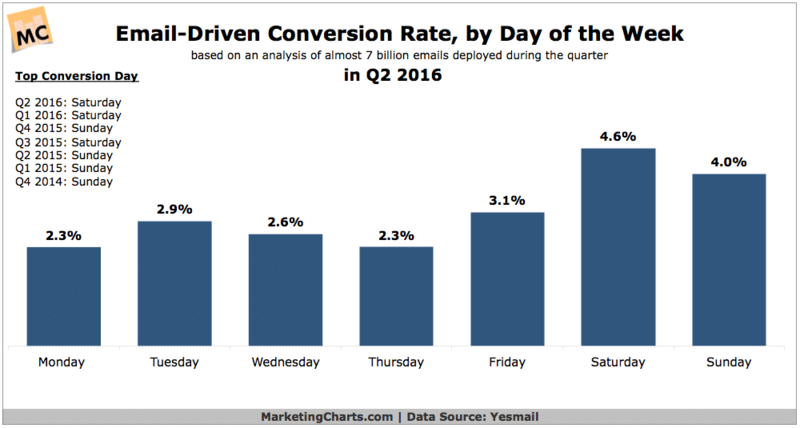 While that suggests that Thursdays are a key opportunity, conversion rates were lowest on Thursdays. In fact, the 2.3% average conversion rate on Thursday was 23% below-average, and half the rate seen on Saturdays (4.6%). Yesmail compared the Q2 findings to quarterly performance over the past 2 years, with some intriguing results. There was no single day that performed best for engagement: though Thursday took the title in each of the past 3 quarters, either Tuesday or Wednesday was tops for the 4 prior quarters. Yesmail links the results to seasonality, pointing out that the 3 major Q4 holidays fell on a Thursday last year, while the year before (when Wednesday reigned), most major events occurred on a Wednesday. While the best day for engagement has varied over the past couple of years, a weekend day has proven the top day for conversions in each quarter. We design & build websites, blogs, print graphics & advertising. Building the foundation of success for your business with credible, consistent & powerful concepts.